Gourmet Direct has been delivering high quality meat cuts to New Zealand’s best addresses since 1992. Begun back in the days of Fortex Ltd in the South Island, Gourmet Direct was born out of a pioneering desire to bring vacuum packed, premium meat products which were being exported and used by a handful of New Zealand Chefs, to the home consumer with a discerning meat palate. 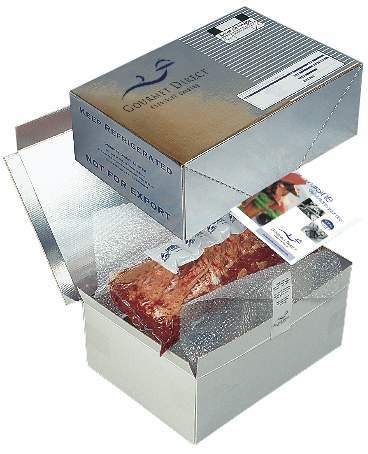 The iconic silver insulated cartons, once synonomous with Gourmet Direct deliveries, began to travel the country, bringing otherwise impossible to find New Zealand meat products to home cooks.In addition to Gourmet Beef, Lamb, Veal and Venison, Gourmet Poultry and small-goods, Pork and Game Birds were already an important part of the product mix, as were a range of condiments designed to compliment the core product range. With the demise of Fortex, Gourmet Direct was brought by Ernest Adams (better known for cakes and savouries) and soon after was purchased by Richmond Limited – one of New Zealand’s largest Meat exporters. Richmond moved the business to Hawkes Bay in the North Island to consolidate it’s operation closer to the main market in Auckland. Food Service (The Restaurant Trade) was always a strong supporter of the Gourmet Direct product range. They used and promoted these extraordinary meat products within New Zealand and overseas. Consistency was key to the success of Gourmet Direct. Customers enjoyed receiving products cut and trimmed in exactly the same way(from the same Grade of animal) every time they ordered. There was a premium to pay for this kind of quality but the result was well worth the investment. In October 2004 Richmond Limited, now under the ownership of PPCS, saw an opportunity to develop the Home Delivery side of Gourmet Direct. They sold that side of the business into private ownership to an experienced marketer, previously employed by them managing the brand. Kate King took over the business with a passion for the history and foundation principles of Gourmet Direct and most importantly an obsession for Customer Service. Critical to the success of this venture was a strong supply agreement binding the established product specifications to the business ensuring that Customers would continue to receive the consistent quality that they had enjoyed in the past. Our customers invest in the best for their homes and vehicles. They enjoy fine wine and they demand the best ingredients to cook with in their kitchens. They are smart consumers buying at the top knowing they will consistently receive quality produce. We source and deliver those ingredients to our busy clientele nationwide. Our product range is designed around strict specifications sourced from expert suppliers ensuring that our customers know what to expect every time. Supplying quality products to Gourmet Direct is a partnership in excellence which allows New Zealanders access to top quality export cuts with the convenience of door-to-door delivery. Contact us on 0800 737 800 or +64 6 833 7966 or visit 17 Mahia Street, Ahuriri, Napier, Hawkes Bay.